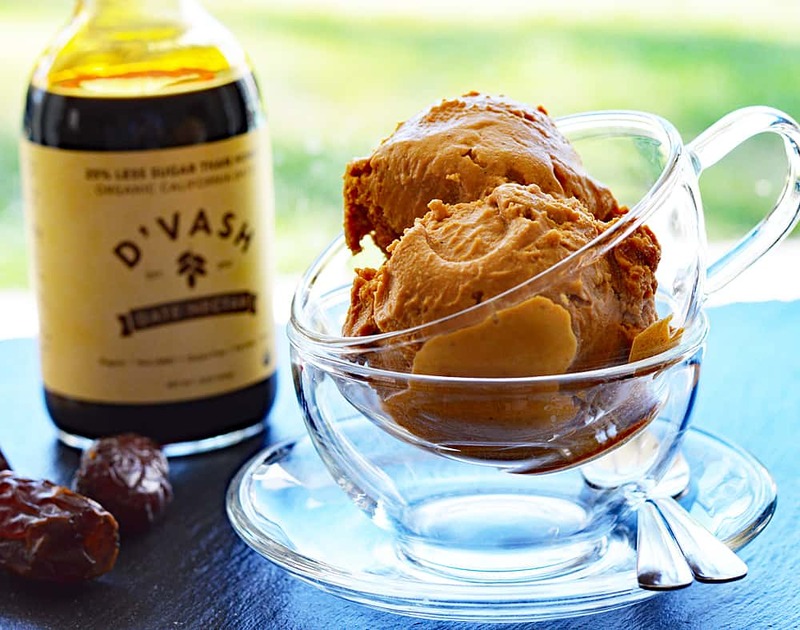 This ice cream has won the hearts of many friends and family who have sampled it. It does work best with an ice cream maker since the machine helps incorporate air. If you have a stand mixer with an ice cream bowl attachment or a high speed blender than can make ice cream, perfect! Those work too. I worked hard on this ice cream to make it taste like pumpkin pie (my favorite dessert on the PLANET). It’s almost as if you took the pie, put it in the blender and froze it. It’s just that good! The secret ingredient in this recipe is the use of date nectar! 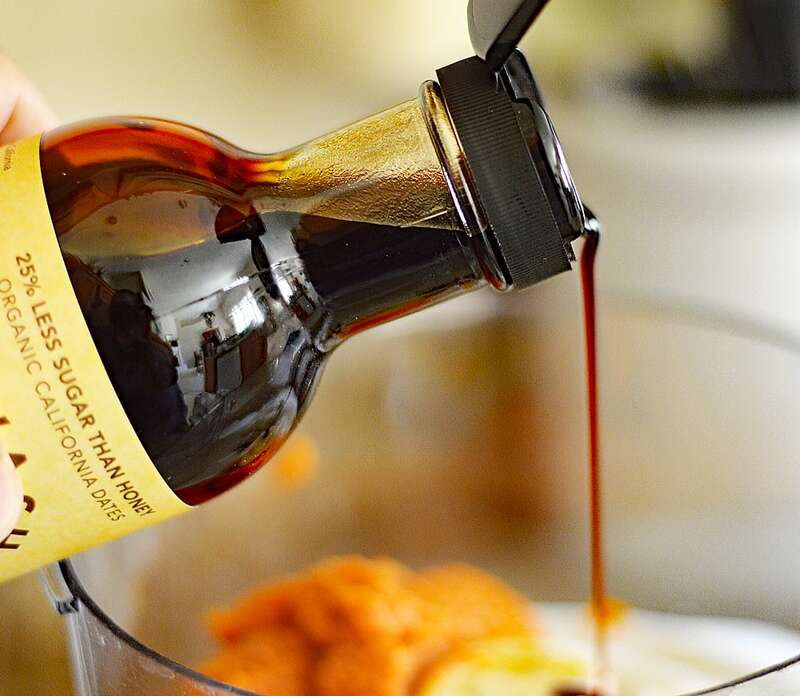 I have been experimenting and using this stuff on everything from this ice cream to baked sweet potatoes, glazed carrots and even BBQ Baked Beans I made the other day (recipe coming soon)! It gives a wonderful richness and depth of flavor. The only pre-planning involved in this recipe is that you do need to freeze the ice cream maker bowl AND chill the can of coconut milk in the refrigerator overnight. Some of those chunky, coco-nutty bits remain when frozen and made a lover out of this non-coconut loving person. It almost tastes like frozen white chocolate. Can you see them in there? 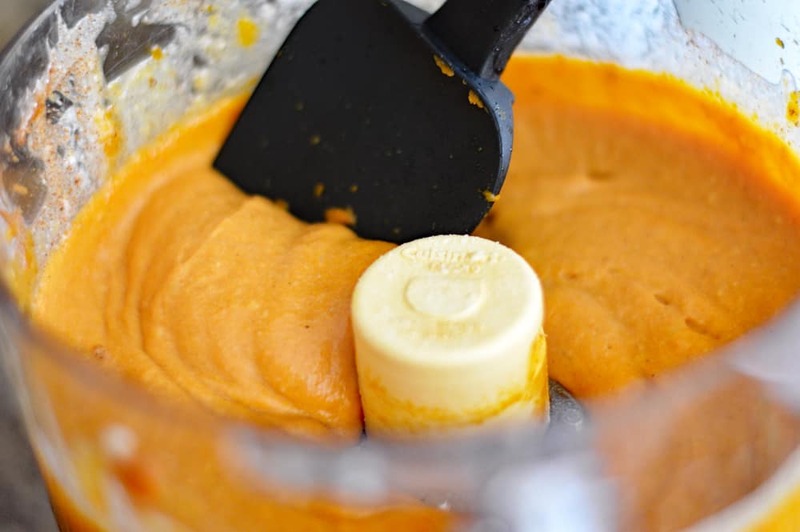 Frozen YUM 🙂 The pumpkin mixture does get pureed in the food processor or blender prior to hitting the ice cream maker. To get the chunks, just under process a little. Even an ice cream maker won’t freeze ice cream solid, so I take that soft-serve ice cream and place it in my glass loaf pan. This serves two purposes. One, to freeze it and two, for ease of scoopability! If you are storing the ice cream like this, take it out 15 minutes prior to scooping. It will make your job a whole lot easier. Serve it with a dollop of non-dairy whipped topping, your favorite chopped nuts, crumbled graham crackers…the possibilities are endless! 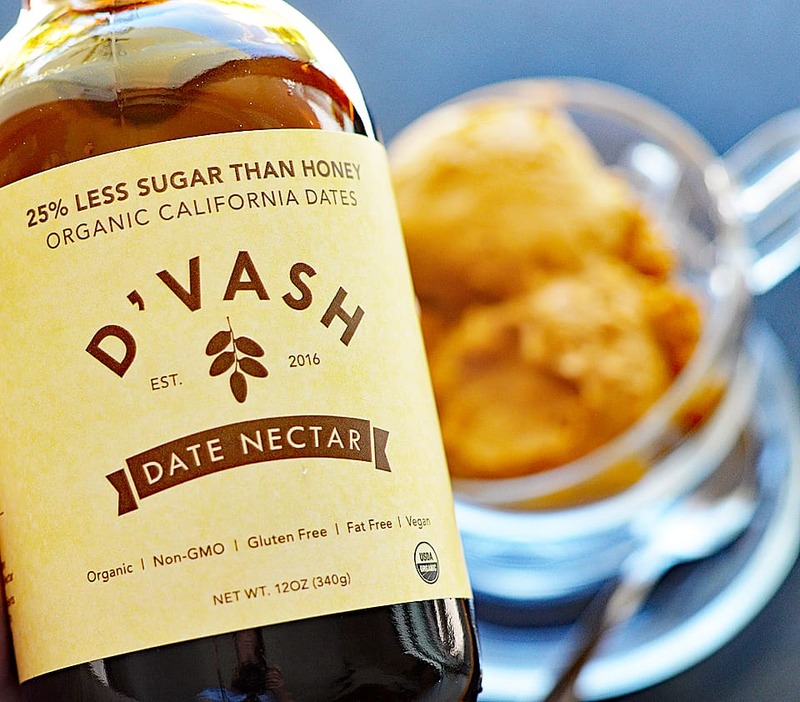 To order D’Vash Organics Date Nectar, visit them here. Also, do a me a favor and show them some love on their social media accounts. You can like/follow them on Facebook, Pinterest and on Instagram for even more delicious inspiration! *For every purchase you make through the D’Vash affiliate link, The Veg Life! receives a small portion of the sale which helps support bringing you more original recipes! The night before you plan to make this ice cream, place the bowl of your ice cream maker into the freezer and a can of coconut milk into the back of your refrigerator. 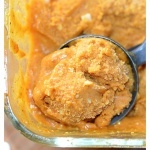 Using an electric mixer or hand mixer, combine the cold coconut milk (with all of its liquid) and the pumpkin. Add sugar, date nectar and spices. Taste for seasoning. Process according to your ice cream maker instructions. It will be a soft-serve consistency at this point which is fine to eat, but not very scoop-able. I placed mine into a glass loaf pan and froze for several hours before serving. To store, place into covered freezer-safe containers. Serve with your favorite nuts, such as pecans, graham crackers or non-dairy whipped cream. I am soooo glad I found this recipe, I am sick of all the pumpking french fries, pumpking soups and pumpkin breads. Really needed a sweet pumpkin recipe 🙂 thank you! !